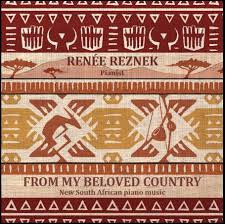 Given the relative lack of exposure that the music of South African contemporary composers receive, a new release from Prima Facie http://ascrecords.com/primafacie entitled From My Beloved Country featuring pianist, Renée Reznek www.reneereznek.com , is especially welcome. Renée Reznek was born in South Africa and studied with Adolf Hallis, a pupil of Tobias Mattay. She later studied with Lamar Crowson, graduating with distinction from the University of Cape Town with a Bachelor of Music degree. She subsequently received a scholarship to study with Gyorgy Sandor at the University of Michigan, USA. Reznek made her London debut in the Park Lane Group’s series Young Artists and Twentieth Century Music, playing Debussy, Schoenberg and a new piece written for her by Robert Saxton. She has received critical acclaim for her playing and for her adventurous programming and was much praised for her Wigmore Hall recital of the complete solo piano music of Schoenberg, Berg and Webern. She has performed throughout Britain, Europe and South Africa, giving solo recitals as well as performing concerti and chamber music. Renée Reznek commissioned Neo Muyanga’s Hade, TaTa (Sorry Father) (2013) in honour of Nelson Mandela and to celebrate the 20th anniversary of the first democratic elections in South Africa. Born in Soweto, heir to a long line of musicians, Muyanga draws on traditional Sesotho and Zulu music fused with Ethiopian melismatic style, jazz and western classical music. Hade, TaTa has a slow thoughtful opening that expands through some fine harmonies, soon brightening, finding little rhythmic variations that make the music skip along with a fine melody running through. There are passages of greater breadth that bring lovely sonorities before the music returns to its gentler nature, developing into a bluesy tune with Reznek bringing a lovely, subtle touch. Kevin Volans’ PMB Impromptu (2014) celebrates a shared birthplace, referencing both African and Western European traditions, sometimes humorously. A fast, delicate motif appears over which notes are laid with varying rhythmic patterns as the music develops between both hands, stunningly played here. The piece is continually developing through some fine sonorities before a slow, gentle coda. Volans’ Garden of Forking Paths (2014) proceeds at a mesmeric, meditative pace, opening with gentle harmonies, this pianist finding the most lovely touch as the music subtly and slowly develops. There are some gorgeous harmonies, creating a lovely remote atmosphere. Michael Blake’s Broken Line (2015) is influenced by Eastern Cape bow music and exudes a vitality which evokes Africa. A staccato rhythmic motif opens, quickly varying and occasionally finding broader passages, though always retaining the same basic idea. Throughout, the music varies in tempo and harmonies, a terrific exercise in writing around a simple unchanging theme. Blake’s Seventh Must Fall (2016) is equally minimalist, a response to protests at South African Universities. A melancholy descending theme is gently taken forward. As it progresses it becomes subtly slower, an effect that only serves to add to the melancholy. Rob Fokkens’ delicately minimalist Five Miniatures (2007) also relate to Xhosa bow traditions as well as Western European style. The opening miniature follows the preceding track beautifully with a slow intricately thoughtful theme. The next is a faster, rhythmically pointed theme that darts around before rising upwards at the end. Another quiet and gentle, yet animated, piece follows before rapid arpeggios sound out brilliantly. The fifth and final miniature brings a gentle conclusion, a gentle rhythmic sway that is interrupted by a faster idea. Hendrik Hofmeyr is an Afrikaans composer who went into voluntary exile, only returning to South Africa at the end of apartheid. His Partita Africana I. Preludio II. (2006) includes fragments of San music. The rich, rolling chords that open are soon interrupted by a hushed gentle theme. The chords develop each time, increasing in strength only to fall to a quieter, thoughtful section that develops through a rather lovely, sad passage. The music rises in strength before its conclusion, now interrupted by the quieter theme. Hofmeyr’s Umsindo (2006) brings an offset rhythmic idea that is developed through broader passages, finding some lovely harmonies, always retaining the irregular rhythms. There are some terrific repeated phrases before a sudden declamatory conclusion. Peter Klatzow’s Barcarolle (Arnold Schoenberg in Venice) (2005), which quotes from Schoenberg, does not draw on African influences. It brings a gently rocking theme through which Klatzow weaves some fine melodic lines, developing through some impressive bars with moments of great beauty, exquisitely brought out by Reznek. There are passages of increased strength and passion before finding a quiet close. David Earl’s Song Without Words (2014) has an attractive, light and carefree quality, a simple beauty of its own, this pianist shaping it to perfection. Earl’s Barcarolle (2014) brings a slow opening that seems to have a deeper undercurrent. It proceeds through some lovely broad passages, developing a fine melody. 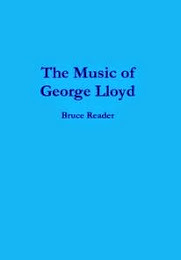 Later there is a moment of quieter hesitation before the music regains its breadth as it moves through some very fine harmonies and textures, falling to lead to a lovely little coda that, nevertheless, ends on a decisive flourish. David Kosviner’s Mbira Melody II (2016) is reminiscent of kalimba (an African instrument with a wooden board with staggered metal keys) music across the continent, bringing a repeated, rhythmic motif around which ideas grow, a melodic theme emerging. The opening idea continues as the melody expands over the rhythmic line, Renée Reznek bringing a great clarity. Eventually the melody takes on the rhythmic nature of the repeated idea. A joyous piece to end this terrific, varied recital. This is a welcome opportunity to hear contemporary South African piano works particularly in such fine performances. The recording is rather close but reveals much detail. There are useful booklet notes. It was not until his String Quartet in D minor of 1953 that he felt he had ‘fully indulged (his) love of melodic subtlety and invention,’ titling it his Quartet No.1. 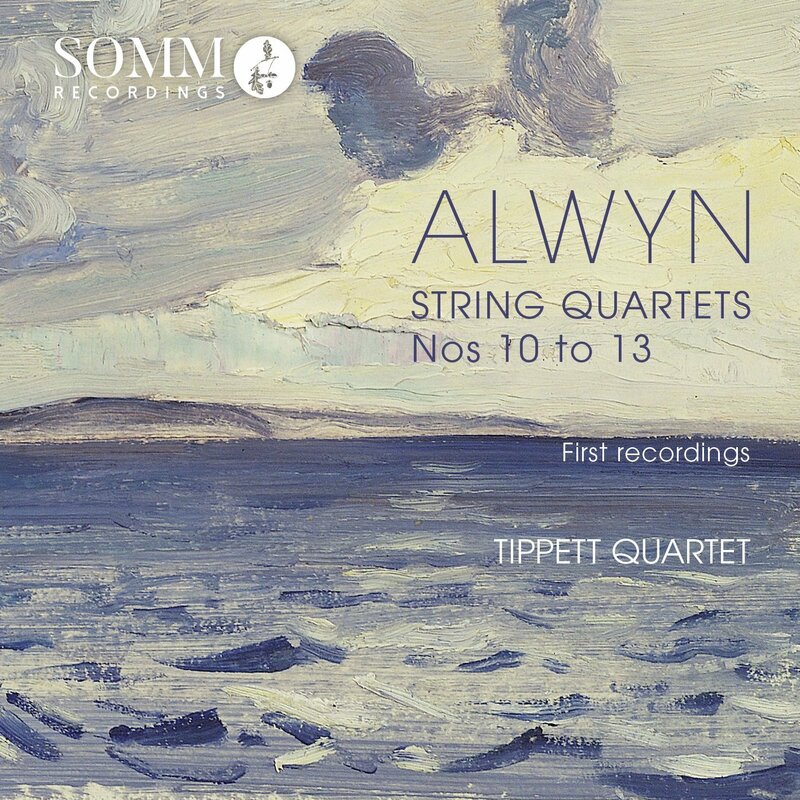 Sadly these early string quartets have never been recorded making the premiere recordings of Nos 10 to 13 from the acclaimed Tippett Quartet www.tippettquartet.co.uk for Somm Recordings www.somm-recordings.com all the more welcome. William Alwyn was born in Northampton, England and studied with Sir John McEwen (1868-1948) at the Royal Academy of Music in London, where he later taught. In 1961 he retired to Suffolk to compose. His compositions include five symphonies, concertos, an opera Miss Julie, vocal works, piano pieces, chamber works and over 60 film scores. In four movements the first is entitled Departure (Adagio e dolente) and opens with a gentle theme introduced by the viola which is immediately taken up by the whole Quartet. The Tippett Quartet finds every little detail and nuance in this beautifully pastoral adagio. Soon there is a repeated violin motif around which the theme is developed, adding a gentle rocking motion. The music rises dynamically midway before finding the gentle peace of the opening, with some beautifully ripe string tone from the cello. Sea Birds (Allegro vivace) springs into life with a pizzicato chord to move full of spirit, through passages that evoke fresh air and open spaces. Centrally a wistful section appears with a lovely descending motif before further more reflective moments are heard only to race to a terrific coda. The Lonely Waters (Adagio ma non troppo) brings a gentle, hushed two note rising and falling motif for violins and viola to which the cello adds a deep line. It is the cello that continues the melancholy theme over the rest of the Quartet, a quite lovely idea. Later the theme is taken by all the players, finding a quiet passion as it develops, the cello again adding deep rich tones, through a quieter, sombre passage that leads to the coda. Trade Winds (Vivace) has a sparkling opening that brings some very fine playing from the Tippett Quartet in this fast and breezy movement. The music soon finds a greater flow as the melody is developed, finely shaped by this Quartet, bringing forth every rise and fall. Later there is a rather romantic moment before the music scurries to the coda to conclude on a held cello note. String Quartet No. 11 in B minor was written in April and May 1933 and is in three movements. The first movement opens with an Andante ma non Troppo that rises out of a cello motif, slowly finding a fresher sound as it develops, through passages of varying tempi and dynamics before rising for the Allegro con brio to dash forward energetically with some beautifully turned phrases, later finding richer sonorities. The opening motif re-appears before the music takes off energetically again with this Quartet creating a terrific energy and forward pulse. When the lovely reflective Andante arrives there is some beautiful writing for strings before we are led to the hushed coda; a glorious moment. Alwyn created a lovely opening idea for the second movement Andante e semplice, full of pathos as the viola brings the melody over a repeated idea for violins. There are some lovely little details revealed by the Tippett Quartet as the music slowly weaves through some lovely passages, finding a passionate edge as it develops, yet always returning to its gentler feel. Quite lovely. The Quartet weave a lovely opening to the final Moderato e quieto, gentle yet flowing, moving through some exquisite ideas with a rising and falling motif. The music rises in dynamics midway before finding a bittersweet passage that leads to a gentle coda. This work is a definite step forward from the preceding quartets, opening with more advanced, often dissonant harmonies, full of brilliance and breadth. The music falls through some fine passages where the cello brings deeper tones over the rest of the quartet. Once again there is a freshness and vitality before a slower section, beautifully shaped and nuanced. The cello develops some lovely phrases around the other players, rising in drama, finding moments of depth and feeling before the opening dissonant idea quietly returns. There are moments of increased passion as a dissonant descending motif appears. The cello brings passionate phrases over a gentler quartet line before leaping up with energy. Later the cello brings a deep rich passage which is developed until springing out across the quartet. It is a rich quieter passage, full of intense feeling, that leads to a shimmering, hushed coda. String Quartet No. 13 was written during October and November 1936, but never performed in the composer’s lifetime. In two movements, The Tippett Quartet dig deep into their strings in the passionate outburst that is the opening of the Adagio e largamente e marcato before leading through an impressive tapestry of harmonies and sonorities as the music flows forward. There is a gentler section where some fine ideas are woven as well as a moment of pensive deliberation that precedes some more intense phrases. Later the music falls to a hush before slowly raising itself up to move slowly forward through a moment of exquisite feeling, finding a wistful solace at the end. Pizzicato phrases help to propel the Allegro molto e vivace allegro forward until a jaunty little theme arrives, recalling the pastoral nature of earlier quartets. Yet still there is a more advanced edge in the harmonies as the music weaves some fine passages. There are some really lovely bittersweet passages before rising through moments of increased depth and passion. Later the music suddenly picks up to move quickly forward with pizzicato phrases driving the pace. This Quartet brings some brilliantly played, fast, richly woven textures before the music finds the slower, flowing pastoral theme with lovely harmonies that leads to a hushed coda. 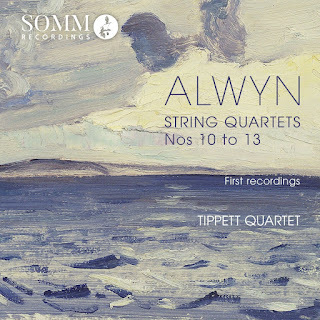 Alwyn may have dismissed these quartets but they offer much pleasure, particularly in performances as fine as these from the Tippett Quartet. The Tippett Quartet are well recorded at St. Nicholas Parish Church, Thames Ditton, England and there are excellent notes. Let us hope that Somm will allow the Tippett Quartet to record more of these early quartets. The Flemish composer, Giaches de Wert (c. 1535-1596) is believed to have been born in Antwerp. He was sent to Italy at a young age where he became a chorister at the house of Maria di Cardona, Marchese della Padulla. He later became a member of the choir formed by Alfonso Gonzaga at Novellara but soon made connections with the nearby ducal courts of Mantua where he eventually became maestro di cappella at the ducal chapel of S. Barbara, Mantua. 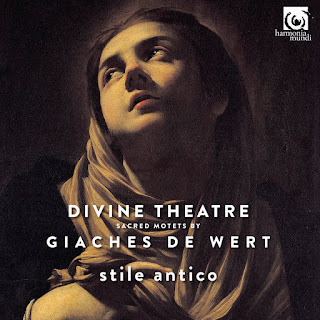 Stile Antico www.stileantico.co.uk have gathered together a collection of Sacred Motets by Giaches de Wert for a new release from Harmonia Mundi www.harmoniamundi.com entitled Divine Theatre. The whole choir opens Gaudete in Domino a 5 (Rejoice in the Lord). It is full of life and vitality, as Wert’s wonderful harmonies are woven with a feeling of true rejoicing to a sonorous conclusion. Hoc enim sentite in vobis a 5 (For let this attitude be yours) slowly expands with this choir bringing the most exquisite textures and sonorities, all the while individual sections of the choir shining through, finding some lovely subtle nuances, shaping this music beautifully. The music rises centrally through some wonderfully uplifting passages, the choir later bringing some lovely rich textures. Stile Antico bring a fine rhythmic control to the fine part writing of Saule, Saule a8, a distinctive motet that would surely bring challenges for any choir. This choir responds wonderfully, shaping some lovely passages. Male voices open the slow and mournful motet, Vox in Rama audita est a 5 (A voice was heard in Ramah) expanding across the choir with the female voices adding some very lovely moments. As the motet develops, this choir rises through some passages that positively glow before bringing this quite wonderful work to a beautifully controlled conclusion. The choir rises through some finely transparent, beautifully blended moments in Amen, amen dico vobis a 5 (Truly, truly, I say to you) finding passages of rhythmic buoyancy around a gentler flow before picking up in rhythm to all but dance to the end. Stile Antico bring some of their finest harmonies in Egressus Jesus a7 (Jesus went out) with some distinctive rising phrases that lift this music, often bringing a great passion. The choir sounds out passionately in the opening of Peccavi super numerum a6 (I have sinned more than the number) before finding a gentler flow in this gently rising and falling penitent motet. This choir find so many wonderful moments, bringing a great subtlety and attention to every detail, picking up rhythmically before a gentle conclusion. There is a gentle yet passionate opening to O Crux ave, spes unica a5 (Hail, O Cross, our only hope), this choir finding a subtle fluctuation of emotional strength, a lovely ebb and flow throughout as this mournful text unfolds. The six voices used in Ascendente Jesu in naviculam a6 (When Jesus had climbed into the boat) weave some very lovely harmonies and sonorities, responding wonderfully to every little rhythmic detail with some particularly fine moments for the female voices before leading to a remarkably fine coda. Female voices take the motet Virgo Maria hodie ad coelum a6 (Today the Virgin Mary is taken up into heaven) joyfully and buoyantly forward, the whole choir joining to weave some extraordinarily fine harmonies with some beautifully controlled moments at Quasi flos rosarum in diebus vernis, (As the flower of roses in the spring) such a fine gentle blend of voices that, nevertheless, retains a fine forward momentum. A single tenor opens Quiescat vox tua a ploratu a6 (Keep your voice from weeping) joined immediately by the other voices to slowly weave and blend the most lovely sonorities in another mournful motet, a setting of Jeremiah, yet finding moments of greater rhythmic buoyancy. The whole choir brings a radiant Deus iustus, et salvans a6 (A just God and a Saviour) a perfect vehicle for Stile Antico’s glorious choral textures, rising and falling through some terrific passages. O altitudo divitiarum a6 (Oh, the height of riches) is an ideal motet to conclude this disc, the choir finding a wonderful, ever changing pulse and rubato as this piece moves ahead through such fine textures. It is this choir’s exquisite control, ability to shape and colour and lift the music that makes these performances so spectacularly fine, showing Giaches de Wert to be a composer of distinctive style. Stile Antico receive a first class recording from All Hallows’ Church, Gospel Oak, London, UK and there are excellent booklet notes from Matthew O’Donovan. David Lumsdaine (b. 1931) was born in Australia and studied at the New South Wales Conservatorium of Music before moving to England. In London he studied composition with Lennox Berkeley at the Royal Academy of Music. After taking a position as lecturer at Durham University he went on to become a senior lecturer at King's College London. In 1979 he married the composer Nicola LeFanu. David Lumsdaine’s compositions range across choral, vocal, orchestral, ballet, instrumental and chamber music. Nicola LeFanu (b. 1947) was born in England, the daughter of William LeFanu and the composer Elizabeth Maconchy. She studied at Oxford, the Royal College of Music and, as a Harkness Fellow, at Harvard. From 1994 to 2008 she was Professor of Music at the University of York and has taught composition at Kings' College London. She has also directed Morley College Music Theatre. LeFanu has Honorary Doctorates from the Universities of Durham, Aberdeen and Open University and is an Honorary Fellow of St Hilda’s College Oxford. She is also a Fellow of the Royal College of Music and a Fellow of Trinity College London. In 2015 she was awarded the Elgar bursary, which carries a commission from the Royal Philharmonic Society for BBC Symphony Orchestra. Nicola LeFanu’s compositions include operas and music theatre, choral, vocal, orchestral, chamber and instrumental music. Nicola LeFanu’s Invisible Places in 16 continuous sections, for clarinet and string quartet, is in sixteen small movements that play continuously. The composer tells us that the starting point for this work was Italo Calvino’s (1923-1985) Invisible Cities, offering a model of how to create a continuous narrative through tiny, discontinuous ideas. But it is Calvino’s book, The Great Khan that senses the nightmare of our ‘brave new world.’ Damaris Wollen and the Brindisi String Quartet gave the first performance in 1986. The clarinet brings a questioning motif, developed by the strings through some lovely ideas and textures, the clarinet adding some fine colours and tones. We are taken through a subtly faster section, an atmospheric movement for clarinet where the soloist achieves some terrific sounds before the strings bring a slow and thoughtful section, interrupted by more abrasive moments. Pizzicato phrases hurtle by before the clarinet joins. There are hesitant string chords with clarinet phrases bubble forth between gentler, flowing moments. Midway the music finds a spaciousness as the clarinet appears over string chords, swirling and soaring, often becoming shrill. The strings hurtle aggressively forward before finding a gentler nature. There are repeated pizzicato chords out of which a melody arises with the clarinet bringing a high long note out of which develops some bird like phrases as the theme is taken through some brilliantly lithe passages. Stronger string chords are followed by atmospheric harmonies, the opening idea re-occurs bringing more passion. The clarinet is heard as the strummed string chords are played. There are more passionate pizzicato phrases before a gentler, fast moving idea for strings and clarinet that darts around quickly with outbursts. The clarinet and strings weave some lovely moments before the strings bring strident, pounding chords. The strings dart around, joined by clarinet until slowing into the final section to find a quite beautiful coda. This is a work that takes the listener on a tremendous journey, packing so much in its sixteen minutes. David Lumsdaine’s fire in leaf and grass for soprano and clarinet was composed in 1991and takes a text by Denise Levertov. It was written for a Gemini concert, on the occasion of the composer’s 60th birthday, at St. John’s, Smith Square, London, UK. Soprano, Sarah Leonard alone brings the first line, ‘The fire in leaf and grass’ before being joined by the clarinet of Ian Mitchell with a plangent line that soon becomes more animated. Sarah Leonard brings a beautifully shaped, superbly animated performance with the clarinet adding colour and descriptive ideas, bringing a real sense of a snatched moment in time. Sarah Leonard bursts out with a series of declaimed ‘Ah’s’ showing her great vocal strength and agility in this taxing part. The clarinet slowly and gently joins as the soprano continues with the text with almost sprechgesang delivery. The cello joins as the vocal line becomes more melodic, all three developing some terrific passion. LeFanu uses the clarinet and cello alone to bring moments of intense feeling, a sense of isolation and loss. When the soprano rejoins she adds even more desolate feeling. Both instrumentalists bring a terrific dialogue in their solo passages. There is a particularly intense passage at the words ‘Like rain it sounded…’ with a technical accuracy and mastery from these three performers that is remarkable. The setting moves through more passages of great intensity, passages of deeper richness for the instrumentalists over which the soprano rises bringing more tremendous vocal control. There are some superb instrumental details as we move through moments of gently intense emotion before rising in agitation at the words ‘No more shall white cranes wake and cry’ before the soprano brings the sense of loss to an end. All three performers are quite superb in this hauntingly intense work. In 1975, David Lumsdaine composed his solo piano piece, Ruhe sanfte, sanfte ruh’, a meditation on the final chorus from the St. Matthew Passion. 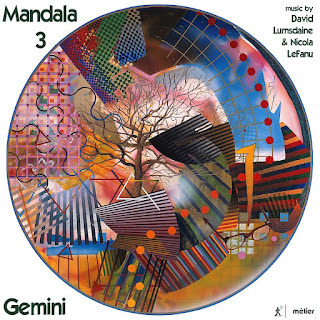 He returned to this work in 1978 when Gemini asked him to compose a work for them, extending it into Mandala 3 for piano, flute, clarinet, viola and cello, a work that lasts some forty minutes. The Sanskrit word Mandala is difficult to define but in general refers to a spiritual and ritual symbol. Here pianist, Aleksander Szram is joined by Gemini members, Ileana Ruhemann (flute/alto flute), Catriona Scott (clarinet), Caroline Balding (viola) and Sophie Harris (cello) with conductor Ian Mitchell (Chinese gong). In three parts I chorale brings a transcription of the original chorus in the style of a classical quintet that flows beautifully, Lumsdaine’s instrumentation adding some lovely lines and textures before suddenly stopping as we go into II sonata where the theme tries to move ahead hesitantly. A Chinese gong is heard as the music finds a more emotional edge, slowly making its way forward through some quite beautiful yet unusual harmonies and ideas. There are flutter tongue flute phrases and pizzicato cello yet the piano tries to bring Bach’s theme through the texture. The gong is heard again as the instrumentalists weave some wonderful harmonies and sounds before rising through a terrific passage with a loud gong stroke. Lumsdaine creates some remarkable ideas as again the piano brings the Bach theme but is overtaken by the others. The instrumentalists blend in some passionate moments where one can hear a Bachian presence only to find a gentle end with a gong stroke before dissolving into the opening of the piano piece, Ruhe sanfte to bring the final and longest section, III fantasia. The piano appears with a gong stroke, slowly and gently moving ahead, growing ever quieter before rising again to take the theme forward, developing some very fine sonorities. The strings quietly and slowly enter as the piano takes the theme ahead through a series of variations, a hesitant piano part against pizzicato viola, flowing through richer textures and broadly spaced phrases. There are anguished moments where pianist, Aleksander Szram brings some impressive moments. Often there is an eastern meditative quality yet punctuated by more dynamic and fragmented passages. Later the other instrumentalists are quietly heard around the piano before sudden faster flights of fancy occur. This pianist brings some beautifully fluent touches with the other instrumentalists bringing lovely gentle sonorities and textures around the piano. There are some particularly impressive broad piano phrases and Bach appears momentarily. There are further moments where Gemini add wonderful harmonies and sonorities over fine piano phrases that grow in stature and complexity and, indeed, dynamics. After a peak, Bach’s lovely theme emerges behind disjointed piano lines causing a harmonic clash. The piano grows louder as if to squash the Bach theme, hammering out the notes, but Bach continues regardless, the piano is silenced and the other instruments are left to gently work around the theme. The piano re-joins as all move through strange, gentle harmonies until a hushed end is reached on a final piano chord. This is a remarkable, tantalising piece full of wonderful ideas. All of the performances are superb; the recording is excellent as are the notes from the composers that include full English texts within a nicely illustrated booklet all of which makes this new release highly recommendable. Manchicourt was a distinctive Franco-Flemish composer born in Béthune, then in the French speaking part of Flanders, now northern France. After serving as a choirboy at Arras Cathedral he went on to become choirmaster at Tours and Tournai cathedrals before, in 1559, becoming master of Philip II’s Flemish chapel in Madrid. He was the composer of many masses, motets and Parisian chansons. This new recording opens with Manchicourt’s motet, Reges terrae (The kings of the Earth) which moves through the female voices across the choir to form a fine tapestry, maintaining some lovely subtle rubato before coming together beautifully at the end. 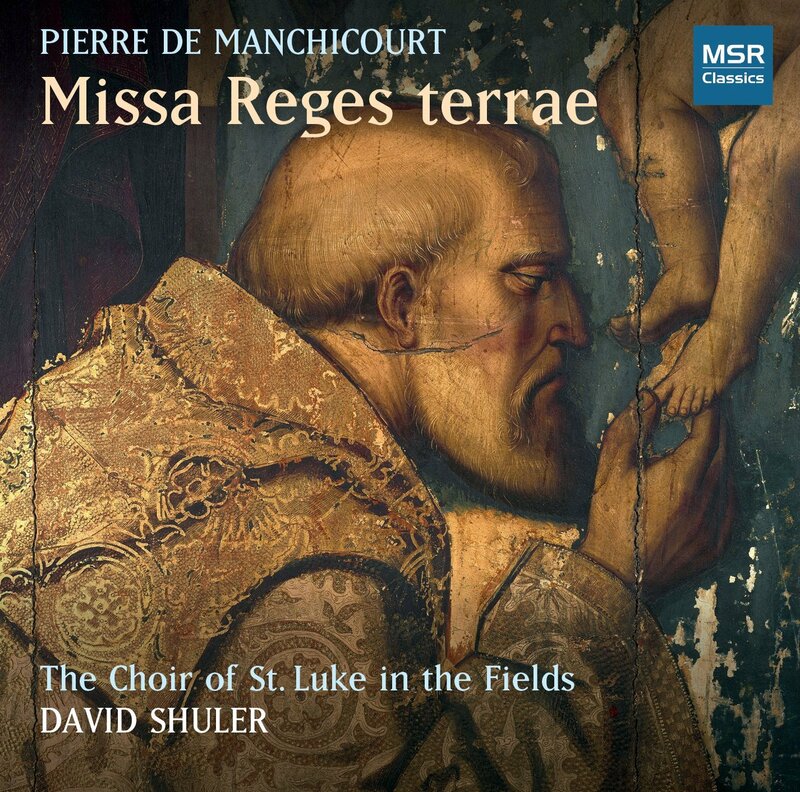 Of particular interest here is the world premiere recording of Manchicourt’s Missa Reges terrae considered to have been written during the composer’s employment by Philip II. The Kyrie has a luminous opening from the female voices of Choir of St. Luke in the Fields before all join for a quite wonderful weaving of choral lines. Manchicourt brings some finely conceived layering of vocal textures, captivating the ear at every moment with so many fine harmonies and sonorities. We are taken straight into the Gloria with a fine tenor bringing the opening words Gloria in Excelcis Deo after which so many of the choir’s individual voices can be heard blending and weaving a glorious musical tapestry. They colour and lift the texts beautifully bringing some impressive moments, finding a little surge in tempo at the conclusion. A tenor opens the Credo before Manchicourt brings some particularly fine luminous textures, so finely revealed by this choir. The ear can follow all the vocal lines such is the clarity of this choir and, indeed, the recording. There is a finely shaped Crucifixus; indeed there are so many finely shaped phrases throughout as well as some lovely textures and sonorities as the Amen is reached. The Sanctus rises beautifully after the Credo, achieving some quite lovely sonorities as this fine section moves mellifluously forward. There is a beautifully woven Benedictus from the female voices with the whole choir rising through the Hosanna. The male voices lead the second Benedictus before rising through a glorious, faster Hosanna. The Agnus Dei brings a wonderful weaving and a fine blend of these very fine voices. The choir bring a terrific precision as the various voices join in the opening of the motet, Caro mea (My flesh) with fine textures and some particularly rich lower sonorities over which the other voices weave some lovely lines. This choir achieve some lovely subtle rises and falls before beefing up the music with Manchicourt’s distinctive change to triple metre to propel the music to its conclusion. Ne Reminiscaris (Remember not) is an absolute gem, slowly emerging through some quite lovely passages before expanding through the choir, full of pathos, beautifully paced, with some absolutely exquisite moments, sung to perfection here. The choir find some especially lovely harmonies in the motet, Vidi Speciosum (I saw the fair one), again with a fine ebb and flow. The layering of vocal lines allows each section of this fine choir to shine through with some beautifully nuanced singing before taking up a triple metre to speed to another fine conclusion. The Choir of St. Luke in the Fields concludes their disc with a joyful Regina Caeli (Queen of Heaven) setting a fine pace as the music moves quickly forward with some lovely weaving of vocal lines. With a world premiere and the Choir of St. Luke in the Fields providing such fine results, this is a must for all early music buffs and surely everyone who enjoys choral music. The choir receive a top notch recording from the Church of St. Mary the Virgin, New York City and there are excellent notes from John Bradley who also prepared the performing editions used here. There are full Latin and English texts provided. A new release from Melodiya http://melody.su features the distinguished pianist, Irina Chukovskaya http://irinachukovskaya.com in works by Dmitri Shostakovich (1906-1975). Born in Tashkent, Uzbekistan into a family of musicians, Irina Chukovskaya began her studies at the age of six with the legendary piano teacher, Tamara Popovich in Central Music School at Tashkent Conservatory. She went on to study at the Central Music School in Moscow, the Moscow Tchaikovsky Conservatory and at Rutgers University, USA. Chopin Piano Competition in Warsaw before establishing herself as an outstanding performer of modern piano music. The great cellist, Mstislav Rostropovich described her playing as ‘remarkable for its virtuosity, sound musicianship, and true artistry.’ She has performed in major venues throughout Russia, Poland, Italy, Israel, South Korea, Greece, Hungary and Taiwan as well as the United States and Canada. In 1989 she moved to the USA where she performed in over half of the fifty states. In 1997 she returned to Russia where she continued her concert activities and embarked upon a teaching career, first at the Moscow Conservatory, then as professor in the piano department of the Gnesins Russian Academy of Music. She has given master-classes in the USA, South Korea, France, Montenegro, Serbia and Greece. In 2010 Ms. Chukovskaya was awarded by the Russian Government with the title ‘Distinguished Service to the Arts of Russia’. Shostakovich’s Piano Sonata No. 2 in B minor, Op. 61 was written in 1943. The first two movements were completed on 18th February in Kuibyshev, where he had been evacuated at the time of the Siege of Leningrad. The third movement was completed whilst at Arkhangelskoye near Moscow on 17th March the same year. Shostakovich himself gave the first performance in the Small Hall of the Moscow Conservatory on 6th June 1943. Irina Chukovskaya brings a fast, fluent touch to the Allegretto delivering a terrific forward drive, beautifully phrased, rising through some quite wonderful dynamic passages with moments of articulation, finely controlled and shaped. She shapes the emerging theme of the Largo beautifully, finding her way through the subtly developing passages quite wonderfully. The central slow staccato section is brilliantly realised. Chukovskaya creates a mesmerisingly intense atmosphere, finding darker passages as the movement continues. She paces the music perfectly with some exquisitely limpid, slow moving passages before the central staccato idea is hinted as the coda is reached. The Moderato opens gently as a theme is introduced and developed, soon gaining more of a flow with constantly shifting harmonies. The music is finely controlled as it very slowly gains in tempo, moving through some very fine harmonies. Soon a broader, more expansive section is reached, beautifully realised by this pianist. She brings a wonderful touch and agility to the fast and intricate passages, developing some moments of intense feeling before slowing and quietening momentarily only to speed through a wonderfully fluent section before finding a settled coda. This pianist delivers a quite wonderful performance that only goes to reinforce how undervalued this work is. By the time Shostakovich composed his 24 Preludes, Op. 34 (1932–1933) he had already written three symphonies, two ballets and two operas. There is a lovely breadth to No. 1 in C major with Chukovskaya finding a lovely rhythmic lift for No. 2 in A minor with great fluency and buoyancy, a lovely touch. No. 3 in G major reveals a directness, a lovely simplicity, beautifully phrased with a fiery interruption before the quiet coda. In No. 4 in E minor this pianist finds all the subtleties of rhythm and phrasing before a sparkling No. 5 in D major that brings terrific dexterity. In No. 6 in B minor she reveals some fine harmonies and dissonances in this lively prelude. This pianist achieves a lovely poise and restraint in No. 7 in A major before bringing her lovely touch to No. 8 in F-sharp minor, rhythmic and wonderfully free flowing. There is a fast moving, fluent No. 9 in E major to which she brings terrific buoyancy before the gentle flow of No. 10 in C-sharp minor, quite lovely, with subtle little rhythmic interruptions. No. 11 in B major - No.12 in G-sharp minor is projected as a rather scatty, fast and furious piece to which she brings a terrific fluency and forward drive with such an even touch. No. 13 in F-sharp major brings lovely dissonant phrases as the rhythmic piece progresses. No. 14 in E-flat minor brings a darker complexion, this pianist finding much depth, atmosphere and, at times, passion. No. 15 in D-flat major is probably one of the better known Op.34 preludes, sparkling and buoyant with a never ending forward movement. No. 16 in B-flat minor brings a rhythmic, spiky march theme, nicely phrased before a gently swaying No. 17 in A-flat major, this pianist finding many lovely nuances. Chukovskaya brings real life and freshness to No. 18 in F minor. No. 19 in E-flat major has a lovely rocking flow, this pianist finding a lovely breadth before a forceful, rollicking No. 20 in C minor, full of dynamism and terrific strength. She provides some lovely rhythmic phrasing for No. 21 in B-flat major and teases out much beauty. A thoughtful No. 22 in G minor. No. 23 in F major brings a fine rhythmic flow with bell like right hand phrases over a rolling left hand before No. 24 in D minor brings a robust rhythmic buoyancy, with not a little humour to conclude. This is a strikingly fine performance. By the time of his Aphorisms, Op. 13, Ten Pieces for Piano (1927) Shostakovich had written, not only his First Symphony (1924/25), but a number of smaller orchestral works and chamber works and was soon to write his first opera, The Nose (1927/28). Aphorisms opens with a rather tentative little Recitative played with moments of sparkle and wit as is the Serenade that seamlessly continues out of the opening piece. Nocturne moves around quickly through some spiky and quickly changing ideas, the composer seemingly trying out ideas, hardly a nocturne at all. Elegy brings a darker flow with deeper chords in the left hand underpinning a more flowing theme. Staccato phrases introduce the Marche funebre before left hand phrases create dissonances. A strident Etude moves quickly forward gaining in strength and dynamics and leading straight into Dance of Death where staccato, dynamic phrases receive some terrific playing from this pianist, dancing forward with tremendous energy. There is a faltering Canon, finely phrased before Legend brings a steady flow with a rising and falling theme out of which Chukovskaya draws some lovely moments, with fine harmonies before it reaches a sombre coda. The concluding Lullaby has a fine sense of freedom, wonderfully phrased as it flows forward, later bringing lovely delicate phrases. This is an impressive recital of works by Shostakovich that are all too rarely heard. Irina Chukovskaya receives an excellent recording and there are useful booklet notes in Russian and English. Naxos www.naxos.com have done much for the music of Sir Peter Maxwell Davies (1934-2016) www.maxopus.com/index.aspx , not only through their reissue of recordings from the Collins Classics catalogue but with their commissioning of the ten Naxos Quartets premiered and recorded by the Maggini Quartet. 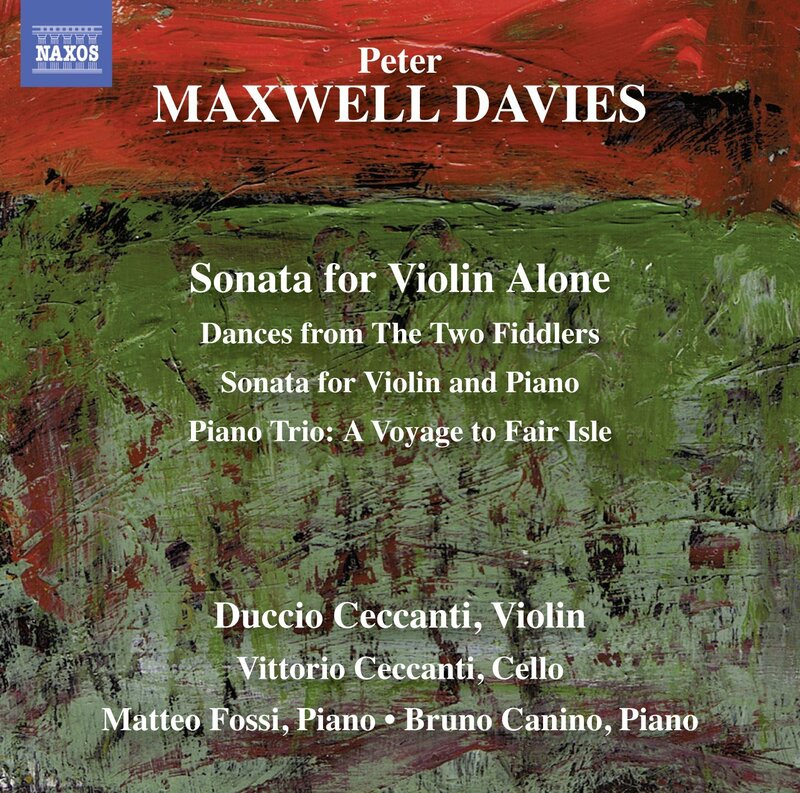 A new release from Naxos continues this work with premiere recordings of chamber works mainly from the composer’s later years, Sonata for Violin Alone, Dances from The Two Fiddlers, Sonata for Violin and Piano and Piano Trio: A Voyage to Fair Isle. Sonata for Violin Alone (2013) is one of Max’s last works; first performed at Teatro Piccolo Arsenale in Venice by its dedicatee the violinist Duccio Ceccanti http://carniarmonie.it/artisti/duccio-ceccanti who gives here the World Premiere Recording. In a single movement the sonata opens with intense chords that are woven through some wonderful sonorities, through exquisitely turned phrases from Duccio Ceccanti. There are some quite lovely little high notes that suddenly contrast against more dynamic phrases before the music finds a faster rhythmic section before continuing its more leisurely forward moving development. Ceccanti provides some very fine harmonies, sonorities and timbres in this quite wonderful outpouring of musical invention. After fading to silence midway, the music suddenly picks up in an intense, faster section with this violinist providing the most wonderful playing. Soon a gentler forward flow is found with further fine sonorities still punctuated by intense, dynamic phrases. Eventually there is a faster rhythmic dancing passage with a terrific forward drive. There are more quite lovely gentler phrases before the music achieves a lovely, gentle flow with glorious harmonies to lead to a beautifully spun coda that rises high in the violin’s register before a final chord. This is a quite wonderful work from this great composer’s final years, brilliantly played by its dedicatee. The recording is clear and vibrant despite being recorded in a large acoustic. Duccio Ceccanti is joined by pianist Matteo Fossi www.matteofossi.com for Dances from The Two Fiddlers (version for violin and piano) (1978/88) in another World Premiere Recording. The dances are taken from Max’s opera The Two Fiddlers which was first performed at Kirkwall, Orkney in June 1978. This arrangement by the composer for violin and piano was premiered by György Pauk and Peter Frankl in 1988. The violin opens with a tentative idea that very quickly develops into a Scottish style dance to which the piano joins. The music is developed through some terrific variations, finding a slower tempo, with a Scottish snap, through a staccato section, slowly gaining in richer textures. Later there is a faster rhythmic Scottish dance for violin against which the piano brings discordant phrases, creating a great texture. Pizzicato violin phrases lead to a lovely variation of the Scottish theme, with some terrific little details before the piano takes the theme over which the violin adds lovely sonorities before taking quickly off to a vibrant conclusion. The piano opens with a phrase to which the violin joins, a rather melancholy theme that is soon overtaken by more violent discordant piano phrases. The leisurely pace continues for both players with little dissonances appearing for piano, Ceccanti and Canino bringing some finely shaped phrases. Soon a fast and furious section tumbles forward with complex rhythms and harmonies. The violin brings a longer melody against a disruptive piano idea before moving through some exquisite moments set against more aggressive piano phrases. There are some wonderful moments where both soloists bring the most distinctive ideas, harmonies and intervals, drawing some fine, dark colours. Occasionally the music is almost schizophrenic in its wild outbursts. Later there is a brief solo passage for violin of cadenza like virtuosity, soon slowing as piano and violin lead through a melancholy slow section. A leisurely tune appears for piano with the violin soon joining in this lovely moment. However it is soon broken up as the theme becomes disjointed. It recovers to a slow, sad flow with sudden little dancing phrases appearing. The music moves through a further slow passage with quite lovely harmonies before finding a more dramatic, aggressive stance. The music rushes forward through swirling phrases with a gentle hushed violin chord at the end. Piano Trio: A Voyage to Fair Isle (2002) received its first performance, with the Grieg Piano Trio, in Kongsberg, Norway in 2003 and is inspired by a trip to Fair Isle for the first ever music festival held there. Again in one movement, it is performed here by pianist Matteo Fossi, violinist Duccio Ceccanti and cellist Vittorio Ceccanti www.vittorioceccanti.com . The cello brings a long held note around which the violin weaves harmonies as the music slowly moves ahead as though through the mists. A deeper cello is joined by fragmented phrases from the piano, creating a terrific atmosphere. The violin and piano move gently forward, soon joined by the deep tones of the cello, adding a weight and depth. It is wonderful how one can hear the melody subtly appearing through the musical texture. Suddenly the music finds a vibrant, energetic rhythmic propulsion before the violin brings lovely harmonies. The piano alone brings a gentle passage to which the violin joins before a fast and furious section in this ever changing land and seascape. Later a rhythmic dancing theme appears for violin which is developed, before the cello adds a slow melancholy idea. The piano joins through passages of deeply melancholic atmosphere with the violin bringing lovely harmonies. The solo cello takes the sad melody through some fine harmonies before the violin provides harmonies over a pizzicato cello. All three pick up the pace through terrific passages as they head to a frantic dancing rhythm before a hushed coda. This new release brings some wonderful chamber works in performances that could not be bettered. The last three works receive excellent recordings in warmer acoustics. There are informative booklet notes. I do hope that Naxos follow up this terrific release with even more of Maxwell Davies’ music.